Comfit manufactures a broad line of gaugeable tube fittings including the Dvi-Lok & Eka Lok fittings. Tube fittings, double ferrule consists of four precision machined components such as body, front ferrule, back ferrule & nuts. Tube fittings, single ferrule consist of three precision-machined components taht includes body, ferrule and nuts. 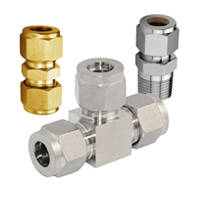 Tube fittings are designed and manufactured to provide a reliable, leak-proof connection in instrumentation and process tubing systems. Available in tube sizes from, in fraction 1/16” to 1” & in metric 2mm to 25 mm. The Comfit Dvi-Lok & Eka Lok fitting has been specifically designed for use on instrumentation, process and control systems, together with equipment employed in chemical, chromatography, petroleum, power generation and pulp & paper plants.